When I was recently in London, I saw two plays with connections to my favorite (make that favourite) British venue, the National Theatre. One was an African-American riff on a 19th-century melodrama, the other a dramatic immersion in a migrant camp on the English Channel. Though quite different in style and content, both wrestle ingeniously with wrenching issues and engage their audiences in unorthodox ways. 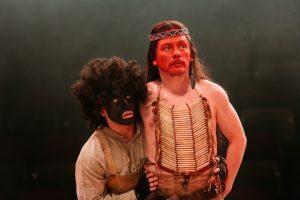 An Octoroon has just closed after a sold-out run in the National’s intimate Dorfman Theatre, but we were able to catch one of the final performances. It’s a metatheatrical fantasia on The Octoroon, a controversial stage sensation by the Irish-born actor-manager Dion Boucicault that premiered in 1859. The original, set on an antebellum Louisiana plantation, has a convoluted plot centering on the fate of the estate and its slaves and the forbidden love between its goodhearted young owner, George, and beautiful Zoe — forbidden because she’s one-eighth black. There’s also a murder, and the action-packed denouement turns on what was then a technological novelty, photography — the dastardly deed is captured on camera. 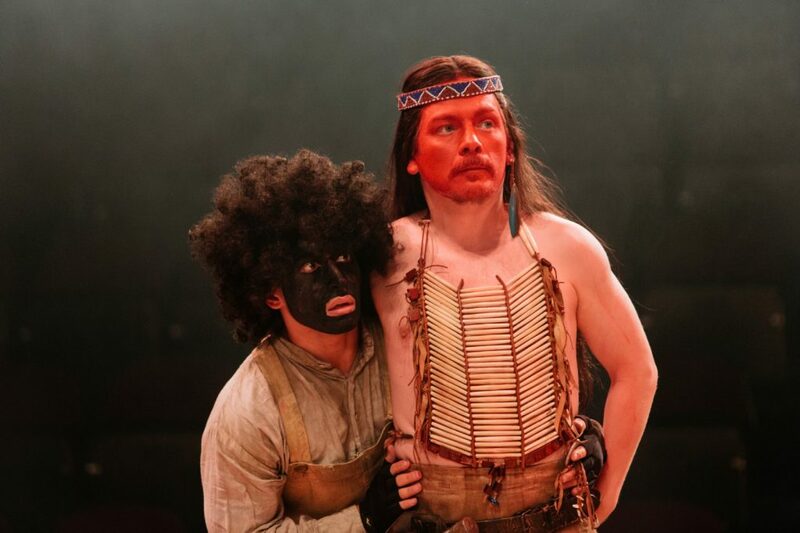 Branden Jacobs-Jenkins’ 2014 Obie-winning play adopts and adapts the original as the framework for an acerbic deconstruction of the conventions of melodrama, blackface minstrelsy, and racial stereotyping. In addition to the original’s main characters, Jacobs-Jenkins introduces “BJJ,” that is, himself, a black man confiding to us, the audience, of his problems with developing this play, especially getting white actors to perform in it. He solves the problem by putting on whiteface to play both the dashing blond hero and the mustache-twirling villain — which later gives rise to a hilariously helter-skelter scene when both of them are onstage at the same time. In Ned Bennett’s trenchant production he’s brilliantly played by the mercurial Ken Nwosu. 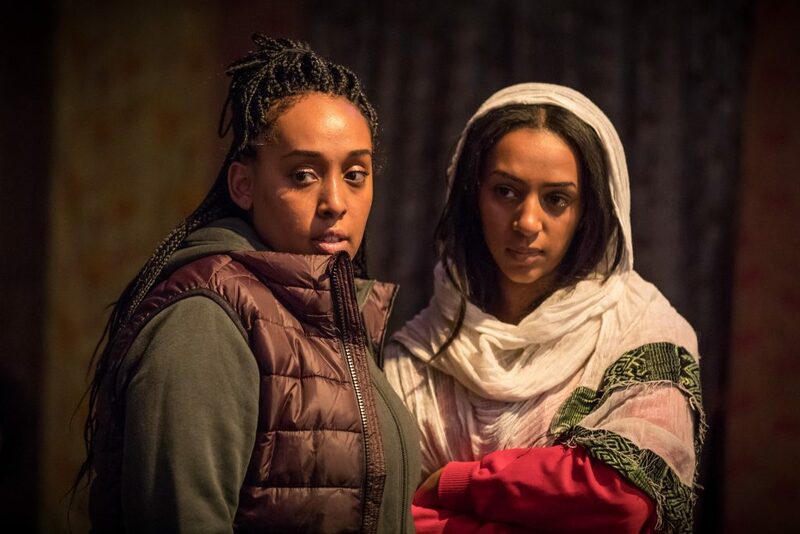 The resulting visual and conceptual contradictions, compounded by screamingly tasteless jokes, produce a reverberating cognitive dissonance, and through that the kind of audience connection that Brecht expounded — a dynamic rather than passive involvement which provokes critical engagement. There’s an even more direct connection between action and audience in The Jungle, first commissioned by the National and now playing in the West End till November 3rd. It takes place in a tent café in the migrant camp at Calais, on the French coast. There, in 2014-16, thousands of refugees congregated, fleeing the violence and chaos in the Middle East and North Africa sparked by the Arab Spring and the U.S.-led “war on terror” — huddled masses yearning for sanctuary in the UK. Yes, theater in a refugee camp — not a do-gooder frill, but proof of the necessity for art to lift the spirit and sustain hope. It was also a recognition of the camp’s semi-permanence. At its height, what became known as the Jungle —from djangal, meaning “forest” in Persian and Pashto — housed some 8,000 people waiting for a “good chance” to cross into England as stowaways on cross-Channel transports. The city of tents and shacks developed into a network of ethnic neighborhoods with mosques and churches, shops and restaurants. The seats in the plush Playhouse Theatre have been cleared out and replaced by a dirt floor. 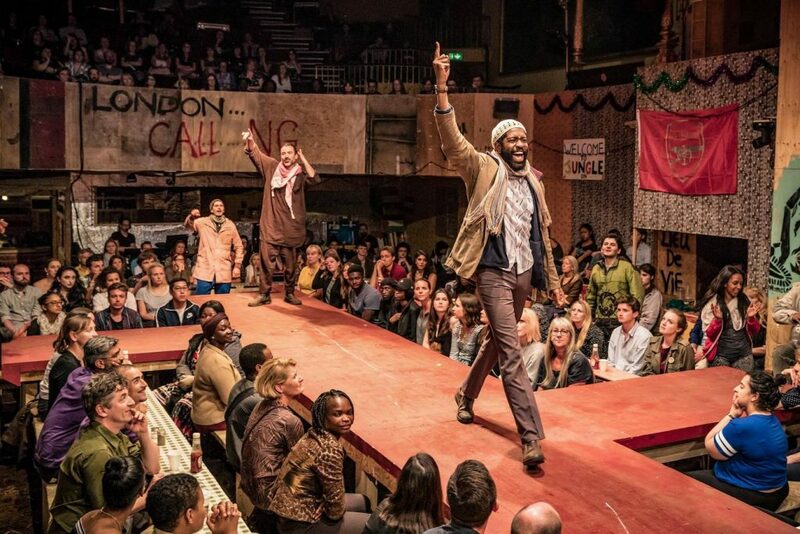 The audience is seated around raised walkways representing the tables in the Afghan Café (based on an actual eatery which received a 4-star review in the Times of London). The play begins with the warning of a threatened clearing of the camp — by negotiation or force — and ends with the roar of bulldozers. In the tense interim, we witness scenes of hope and despair, laughter and grief, bursts of music and flashes of violence. There’s no audience participation per se — though we were often addressed as if we were denizens of the camp (and I was offered chai by one of the performers). But we were literally in the thick of the action, caught up in a human drama at a vortex of our time. 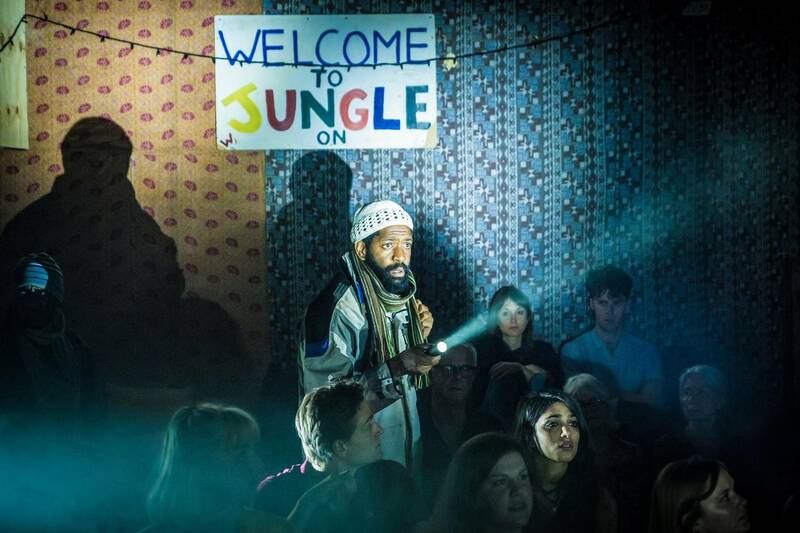 The Jungle isn’t a documentary, but the situation is true-to-life and the characters are vivid composites of real people, vibrantly portrayed by a large, multi-ethnic cast, three of whom actually passed through the camp. A cadre of Brits — all white, like most of the audience — represent the range of impulses that brought outside volunteers to the camp, from “virtue signaling” liberals to dedicated community organizers, and implicitly challenge us to examine our own responses more deeply. 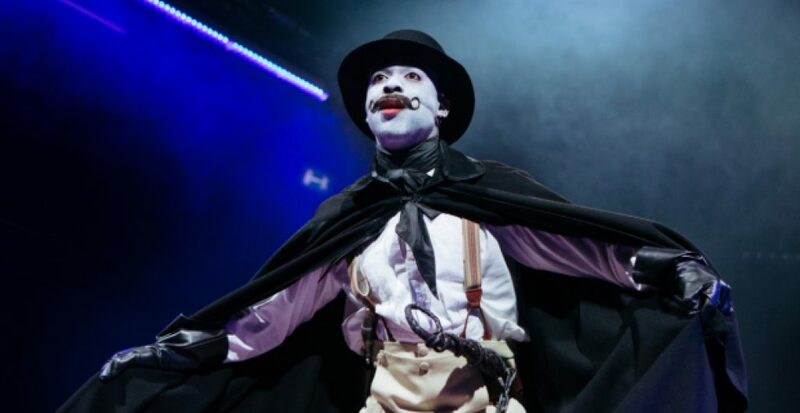 Lively and passionate, angry and joyous, both The Jungle and An Octoroon demonstrate once again the unique ways in which theater can enlighten, disturb, and inspire.